Q. A lot of my beet roots ‘bolt’, i.e. run to seed before the roots are properly developed. What can I do to prevent this? A. The bolting may be due to sowing too soon. If an early sowing is made with the idea of pulling the young roots when about golf-ball size the plants can be left fairly thickly in the rows and some plants will nearly always send up flower stems. It is not such a problem with this early crop as with main crop beet. The latter should not be sown too early, mid-May is time enough. Beet needs to be grown in rich soil without any check, but even so, there is often a tendency for some plants to bolt, and research work is being done to produce strains of seed which are less likely to bolt than those in use at the present time. All one can do as yet is to sow in well-prepared soil which has been well manured with organic manure in the previous year, and water freely in dry spells. Q. Which of the root crops can stay in the ground all winter, in other words, which need not be lifted and stored? A. Parsnips are amongst the most hardy and will stand even severe frost. The roots cannot be lifted when the soil is frozen hard, so when frost threatens lift a few roots and keep them indoors in a cool place, for use as required. Beet must be lifted and stored. Carrots are best lifted, although they will stand a few degrees of frost. Swedes will also stand some frost, but it is best to lift and store as described later. The same applies to turnips. Onions must be lifted in September or late August and stored indoors in a dry cool shed or building on shelves on wire-netting racks or in ropes. To make a rope of onions, first take a thick piece of string about 3 ft. long and tie it to a nail or hook so that the bottom hangs at about the level of one’s chest. Tie an onion to the base, securing the remainder of the old stalk to the string. Next lay a bulb on top of the first one and secure to the string by twisting the remaining stem around the string as shown in Plate 6. If the remaining stalk is so short that it cannot be twisted around the string tie it to the main string. Continue until the ‘rope’ of bulbs, is 2 ft. or so in length. 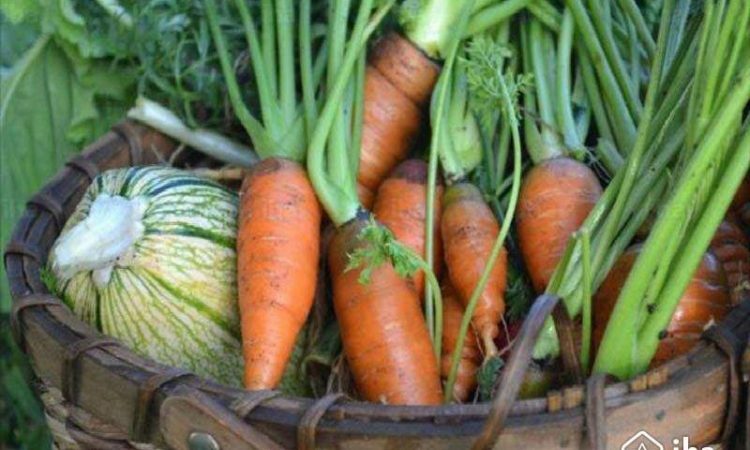 One of the easiest methods of storing root vegetables on a small scale in winter is in peat in an orange box. If such a box with three partitions can be obtained, and carrots, beet and turnips are being stored, a separate compartment can be used for each. If a two-partition box is obtained then more than one vegetable can be stored equally well in a section. Lay 2 in. of dry peat in the bottom of the box, then a layer of roots, either carrots, beet or parsnips or turnips, on top. Cover with an inch of peat and continue in this fashion. The important point to bear in mind is that the roots must be fairly dry when stored. Store only sound specimens, and do not bump or bruise them at any stage. The box must be kept in a frost-proof shed, garage or building and if there is any doubt about the frost-proof nature of the building being used, cover the box at top and sides in severe frost with sacks, old curtain material, old carpet or mats. Q. I plan to try some onion sets this year for the first time. I want small or medium-sized onions, not monsters. At what distance shall I plant the sets? A. Plant the sets at 6 in. spacing for medium-sized bulbs. Plant in well-prepared soil in a shallow drill for preference, so that the depth of planting is such that the tips are just showing above the soil. Do not press hard on the tops of the bulbs between thumb and finger when planting, as this may cause damage later. Q. My runner beans do not set a good crop, they produce ample flowers, but all or most of these drop off, and although the plants themselves and growth generally are satisfactory, the crop is poor. A. Research work is being done on this problem at the present time, and the findings to date indicate that the causes previously thought to be responsible may not in fact contribute to this problem. At one time it was felt that cold weather or cold wet weather, or cold winds, were at least partly responsible, in that in such weather conditions bees and other pollinating insects were less active. In a dry summer it is easy to say that lack of water at the roots cause bud drop, but similar flower-bud drop can and does occur in the wettest of seasons. It is suggested that if some of the flowers are picked off when there is a mass of bloom on the plants the next batch of buds to open will set more satisfactorily than if all flowers are left. Q. Do I have to leave 2, 3 or even 5 ft. between rows of peas? It seems a waste of space to me. A. 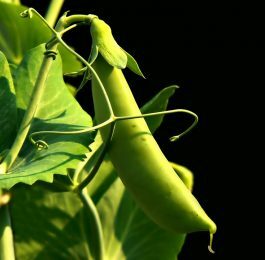 Where space is short, and peas are a popular crop, it is possible to save room by growing two rows closely together. I find that if a dwarf variety is grown in a 4 in. wide drill another such drill can be sown alongside. The first variety should be an early, and the second a main crop or at least a later variety. Careful attention to staking is needed, but if sticks of sufficient height to deal with the later sort are used the two rows can be taken without difficulty. A good combination of varieties is Kelvedon Wonder for the early sowing, with Onward for the later batch. The main point to watch is that there is a marked difference in height in the varieties chosen, and also a difference in season. Q. If I take out trenches to grow celery can I use the same sites for different crops next year? A. If selected vegetable crops are grown in heavily manured trenches, e.g. celery and runner beans, the residue from the farmyard manure or compost left from the preceding year is still valuable, and full use should be made of the same site for other crops which will respond to being grown in these conditions. Peas or leeks will do very well in last season’s celery trench area, as will dwarf beans. Cauliflower is another crop which can be borne in mind. After runner beans and after lettuce has been taken, I like to grow outdoor tomatoes, or to plant the tomatoes amongst any lettuce that still remain. Sweet corn will also do well in such a site. 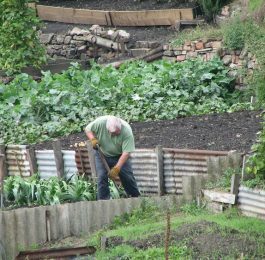 Where a trench is used for a second time no more farmyard manure or compost is needed for the above crops, but apply 4 oz. to each square yard of trench area of a balanced fertilizer, like 3 parts bone meal, 2 parts hoof and horn, and part sulphate of potash. Dig the trench area as deeply as possible, thus mixing in any rotted manure or compost that remains, and make it fairly firm if there is any tendency to loose or ‘puffy’ conditions. `Browning’ of Brussels Sprouts This trouble, which causes a brown discoloration inside the buttons, can be serious. The full causes are not fully understood. It may be due to a check in growth. Possibly because of too much nitrogenous feeding and not enough potash, and also due to spells of dry weather. `Blown’ sprouts A common problem with Brussels Sprouts, and one which often causes annoyance as it comes at the end of the growing season when little or nothing can be done about it, is loose buttons, i.e. sprouts themselves are not firm and are not properly formed. At one time this was often put down to loose soil, i.e. soil not sufficiently firmed at planting time. It is true that part of the trouble may be so caused, but I do not think that it is the whole story. I have sometimes noticed that plants set rather shallowly tend to give blown sprouts, as they are called. This condition may also be due to overmuch nitrogenous feeding early in the growth. It is true that adequate nitrogen is needed, as this helps to give color to the sprouts for one reason, but overmuch should be avoided. If there has been trouble previously with blown sprouts try reducing the amount of nitrogenous fertilizer, and giving extra potash, e.g. 2 oz. of sulphate of potash to the square yard, as well as a general fertilizer mixture as a base dressing. Q. It seems a waste of ground to plant Brussels Sprouts 3 ft. apart each way. 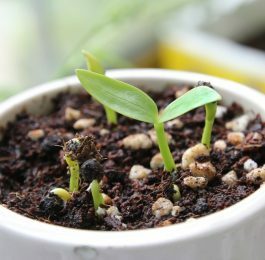 I know there are dwarf-growing varieties which can be set at 2.5 ft. spacing, but what will happen if I plant ordinary varieties at, say, 2 ft. spacing? A. Under garden conditions in rich soil you can certainly plant at 2 ft. spacing. The plants will tend to be rather tall and upright growing. On the whole the individual sprouts may tend to be rather smaller than usual, but for ordinary household use this is a good thing. Strip off any yellow lower leaves from time to time in autumn and early winter. Q. Which winter greens (winter brassicas) will stand severe weather best? I find that in a hard winter I lost most of my sprouts and spring cabbage. I want to avoid time and labor wasted in growing a crop which may be lost anyway. A. In a very severe winter with as much frost as 30 degrees, i.e. temperatures of 20F., and with prolonged periods of severe frost, many brassicas may be killed, especially if the position is exposed and plants are in the teeth of freezing winds. The Kales, e.g. Curly Green, Cottager’s Kale, are amongst the hardiest of the winter brassica group. Q. I am not sure about growing spring cabbage, especially the difference between ‘greens’ and ordinary cabbage. A. Which sort of spring cabbage do you prefer? If large heads, i.e. well-hearted plants, are required then plant at 18 in. spacing between the rows and 15 in. between the plants in the row. If small, half-hearted, tender ‘greens’ are preferred, then plant at much closer spacing, and here, 9 inches square is a suitable distance. It is possible to compromise and plant at this close spacing, but only cut alternate plants in the rows, and alternate rows, thus leaving some plants to heart up fully. In any case, always leave a few plants in the seed bed over winter, as they may be very valuable in early March for planting up as a separate batch, to follow on after the main batch. If the winter has been very severe such a late-planted batch will be even more valuable. For planting out in autumn earmark the site which was used for the main-crop onions, or, better still, the strip which was occupied by runner beans, particularly if these have been grown in a trench. Use small or medium-sized plants, never large plants. Q. I have just taken over another garden, and find that my potatoes, when cooked, have a peculiar taste. Why should this be? A. There are several reasons why there should be such a taint or odd flavor, and in some cases I have met this trouble where it was not possible to pinpoint why there should be a peculiar flavor. One possible reason is taint caused by certain soil insecticides. The same sort of taint can arise with carrots. In one instance I recall having this odd flavor trouble myself in a garden which was very low-lying and adjoining a marshy area of land. I am not sure whether there can be chemicals in disinfectant in strawy manure from stables if such manure was used for potatoes, but it is a point to keep in mind. If tubers are affected by the disease called ‘Scab’ they sometimes have an odd ‘earthy’ flavor. Q. If large seed potato tubers have to be cut what are the important points to bear in mind? A. The variety Majestic heals the cut surfaces slowly, and some of the cut sets may die off. Each half of the cut tuber must have a ‘sprout’. It is best to cut the tuber in half lengthways, for nine-tenths of the length, whilst the tubers are still in trays, i.e. being `chitted’ (sprouted). At planting time just break off the remaining portion. The cut tissue will have healed over by then. If cut at planting time I put the cut sets in right away, but do not plant them in very dry soil. Q. How can I grow some really early potatoes outdoors? A. Set some sprouted tubers of an early variety like Home Guard one to a five-inch whalehide pot in January. Stand them in a cold frame but cover the glass at night time with sacking in cold spells. Harden off for seven to ten days, then plant out of doors, at I ft. spacing, but not until danger of frost has passed, usually in Mid-May. The foliage will need to be covered at night if frost threatens. `Bolting’ of lettuce Lettuce often tend to ‘bolt’, i.e. run to seed, in the summer months, especially in hot dry weather, particularly when no watering is done. A new variety which has been raised for its slow bolting character is called Buttercrunch. I grew this for the first time this season, and found them very satisfactory. Q. What is the least quantity of lettuce to grow at one time to feed a family of four who are keen on salads and where a long season of use is wanted? A. I would suggest that a yard-long length of drill is sown every week from early March to early August, say twenty weeks in all, or for a slightly longer period in the south. Sow the seed thinly on each occasion, i.e. setting the seeds about an inch apart, and thin out the small plants when large enough to handle to 6 in. spacing. This will give small or medium-sized lettuce and aims at six usable lettuce to each yard of row, or roughly one a day, for family use. If you feel that slightly more than this will be required, make the weekly sowing 4 ft. rather than 3 ft. The important point is to make these small sowings regularly. Use a summer variety for either crinkled leaves or smooth leaves or vary the sowings using some of each type. Q. I know that early sticks of rhubarb can be obtained by standing some large drain-pipes over the crowns, but I have none. What can I use as an alternative? A. The largest old buckets you can find, even if there are no bottoms left in them. Pack some straw or some bulky compost around the sides of the buckets. Use straw only if nothing else is available and cover the top of the bucket as well. This forwarding as it is called (rhubarb is forced under glass or in rhubarb sheds) should only be done on well-established crowns, not on oneor two-year-old crowns. Q. Why do the small fruits of marrows rot off before they are properly formed? A. This trouble is usually worst in a wet season when the plants are making a lot of leaf growth or are growing very vigorously. Matters are made worse if the plants are growing on a heap of manure or compost and excess nitrogen plus wet weather causes the fruit to rot, often directly due to the disease Botrytis. I find it best to grow marrows in soil or in soil with not overmuch manure or compost added. If growth is still very strong, and the weather wet, remove some of the leaves with a sharp knife from the centre of the plant to give rather drier conditions at this point, plus a better air circulation. It will also help to add some extra potash in a wet season using sulphate of potash at 2 oz. to the square yard prior to planting. Spraying the plants in wet weather with fungicide is a help. Any damaged fruits affected by the grey fungus spores mould of Botrytis should be picked off and burned to prevent further spread. The first major point to settle is whether main-crop potatoes are to be grown. If the garden is large, then the answer may well be ‘yes’. If it is small or medium size it is usually better to cut out all main-crop varieties of potato and to grow only a few rows of early varieties. Next, decide which vegetables are least liked, or not wanted at all. Then pick out the most popular crops, i.e. those which can be grown given most space. There are usually a few very popular crops, e.g. onions, lettuce, Brussels Sprouts, spring cabbage. One usually has to allow for roots for storage, and a fairly generous supply of winter brassicas. Many of these latter crops can follow summer crops so that the same piece of ground can carry two crops in the same season. Cropping and planning can be made easier by grouping the main types of crops together, e.g. potatoes, legumes, brassicas, salads and root crops, and giving each group a strip or plot to itself.